All good things must come to an end, and that includes incredible musicals such as 9 Works Theatrical's Grease. It is hard to see this production end for I consider it as 9 Works Theatrical's greatest, instantly replacing The Wedding Singer as my all time favorite. So why like Grease? First of all, why not. Grease is a fun show. If you think the movie is great, I assure you that the original live version is 10 times better. In fact, you will hate the movie after you see this one. Material-wise, Grease is a story about youth rebellion set on a High School called Rydel High. The movie has the same idea but threads away from the original vision. 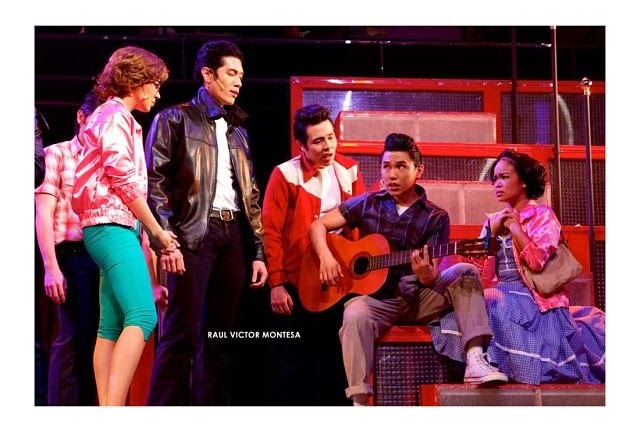 Grease is reach with stories to tell and every characters have their own moments to share. This is my main gripe because the movie version is heavily butchered and transformed into a cheap West Side story Knock off that centers only on the Love story of Sandy and Danny. The rewrites also damaged some of the important character development. In the movie, the rivalry between Sandy and Rizzo is not highlighted. I believe there is also between Danny and Kenickie. Like what I mentioned earlier, supporting cast are not given the chance to shine. Thanks Hollywood for ruining a great material. 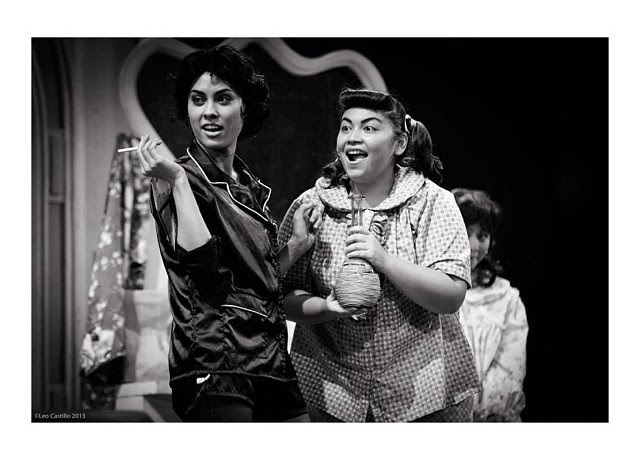 Back to the show, Grease is not just Fun. Grease has swag, it is fierce and it got attitude. You will definitely notice it from start to end. Like The Wedding Singer, Grease' opening number is the perfect way to start such musicals. Lively and loud. Instantly it catches people's attention and keeps our blood rushing with tunes that literally leave our feet tapping on every beat. Another thing you will notice first on the opening is the set and lights. Before the opening starts, the cast performs on a silhouette then bam, the whole stage lights up unveiling a magnificent set design. Just like what I expect. Another masterpiece from the set design genius, Mio Infante. The lights itself also catches my attention. I never thought RCBC has the equipment for this Lighting Design. Well it turns out 9 Works Theatrical bought/rent their own equipment to be added to the current setup in Carlos P. Romulo Auditorium. Talking about dedication. I commend 9 Works for spending more for the lights and of course getting the talented John Batalla for the Lighting Design Execution. Definitely the best among all of his works that I saw. And of course the actors. Hmmm let's see. In general, everybody did an incredible job for Grease. I believe I don't really have any reservations for the performers. I watched the show last week and I strongly believe that they nailed it perfectly just like how I envision it. But of course there are some performance that stands out from the rest. Ever since I saw Frencheska in the movie "Emir", I was already hoping that she try stage musicals. And after a long wait, here she is playing the role loved by so many. I'm also thrilled to hear her perform live as oppose to just listening to her on TV or Movies. Her voice is so powerful that it will creep all over your body creating a sensation that will definitely quench your musical thirst. Another unforgettable performer is Jennifer Blair-Bianco. She definitely captured my whole attention the moment she lead the gang in the opening number. As Betty Rizzo, Jennifer embodies the perfect girl that has the power of an Alpha Female. It also helps that she has this commanding presence and a face that both strong and exquisite. Yep, that jaw also seals the deal. I'm absolutely in love now. And we have Gian as Danny Zuko. This guy never fails to impress me. The passion and dedication he is pouring on his projects are just unparalleled. He is no longer that pop singer we know years ago. He proved that there is something more on him and that is his skills in acting. As a singer, no doubt he is excelling on that field but as an actor, he is definitely improving every time he transforms on every show he accepts. Looking forward to see him explore more roles in the future. 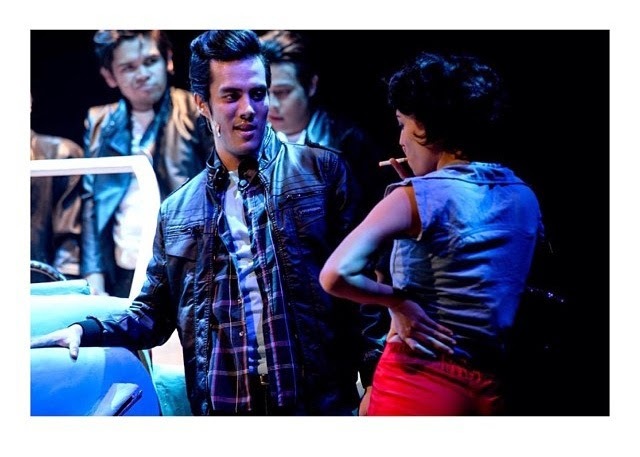 Also another scene stealer is newcomer Rafa Siguion-Reyna who played Kenickie. Not a memorable performance but decent enough to make the girls (and some guys) swoon over his natural charm. Move over Daniel Padilla, Aljur Abrenica and Alden Richards. We have a legit talent here. There are more good things to say about Grease but I guess I don't need to enumerate them all here just to prove how excellent it is. Robbie Guevara (Director) and Santi Santamaria (executive Producer) definitely did it again. They proved that they can outshine all more established Theater companies in Manila. As one of those who witnessed their growth, it is official -- the little kid is now a grown man. 9 Works Theatrical congratulations. Till the next show.